“Just Dunk It” by Velocity @ Novena Square is a social media campaign that instantly gratifies shoppers when they make connections with Velocity @ Novena Square online. 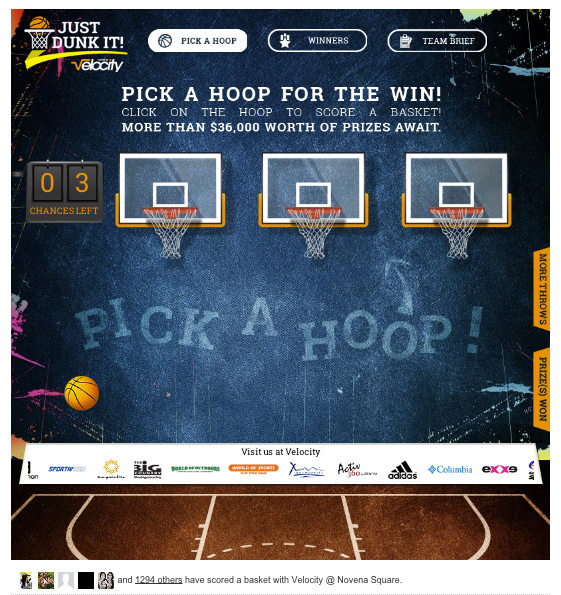 The campaign rallies shoppers to pick a hoop and score a basket to be rewarded with more than $36,000 worth of prizes from the sports-themed mall . The 4-week campaign attracted more than 50,000 active social media users between 18 and 35 years old. More than 2,000 shoppers were directed to the mall to redeem rewards during the campaign.